As Street Feast falls within the time of Ramadan we have been asked how those who are observing Ramadan can take part in the big day. We spoke to Charlotte Bishop from Human Appeal to explain to us what their plans are for their Iftar Night Feast. What a novel idea- a street feast dinner rather than a street feast lunch. Why not? The Human Appeal charity in Dundrum are newbies to the Street Feast idea and are hosting one for Street Feast 2016. Their enthusiasm for it was oh-so briefly quashed when they realised that the 2016 street feast was to fall, slap-bang, in the middle of Ramadan. Yup, that’s right- Ramadan; the most important month in the Muslim calendar which encourages fasting (no food or water!) from sunrise to sunset. Human Appeal, keen to be inclusive of the diverse faiths and cultures in their community, have simply changed the time of the event. 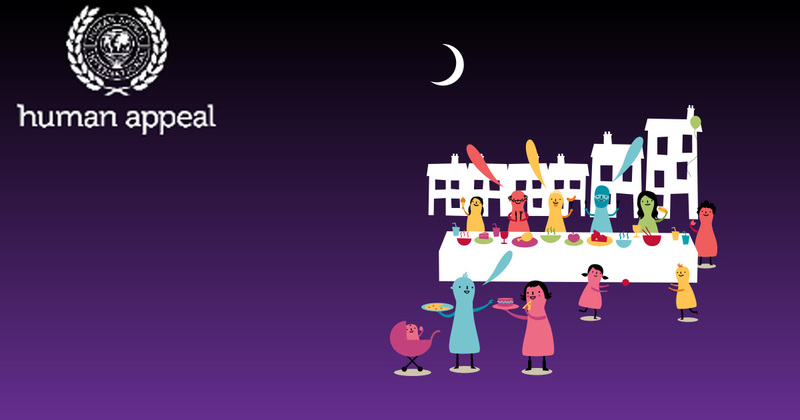 The Dundrum Iftar Night Feast will start at 21:50- this is when the sun sets and the fast broken-and will be held on Saturday the 11th of June. Guaranteed to run into the 12th of June, not only will it be first iftar night feast held in Ireland but also the first feast of Street Feast 2016. “You inhale so much food, you fall into a food coma.” is Amna’s response when I ask her why people might want to join the iftar feast! Tempting. She reels off the list of food that might weigh down an iftar table-Samosas, Pakoras (Fritters), Chaat (Chick-pea salad), Dahi bhalay (Yogurt with fritters), dates, cakes…. Right – definitely one very strong and valid reason for joining! She continues; “An iftar is about community”, she tells me, “It’s about people coming together”. An iftar with the entire community – made-up, of course, of different cultures and religions – is a great idea. Food cultivates questions and conversations and breaks down perceived difference. And why fast? Why put yourself through the torture of not eating or drinking for such a long stretch of time? This year Ramadan falls from the 7th of June to the 6th of July. Those who fast, in Ireland, will not eat or drink for up to 20 hours. And yet…. “I love Ramadan”, exclaims Amna. I’m convinced by her squealing. When she was a child, she’d be “dying to fast”. Fasting made her feel part of something bigger. She sees it as a cleansing or a feeding of the soul. Giving up eating, drinking, smoking and bad habits for the month, definitely does sound like a good cleanse. So it’s about people and community and stories and sharing. It’s about realising similarities with a shared starting point- food! Human Appeal will provide the table and they and their neighbours will add food and drink and colour and diversity to it. Do please join us! For more information about this iftar feast, please visit their facebook page.